As I sit to write this post, I realize that being a vendor impacted some of my actions as a bride. What I learned as a vendor, helped me be the best bride I could be. If I hadn’t ever experienced “the other side” of it, I may not have known any better, which is why I’m going to share this tip with you all today. When you reach out to a vendor that you really want to work with for the first time, give them as much information as you can. Tell them about your love story. Tell them about your day. Tell them how you envision them working with you on your day. Tell them why you think they’re the best fit for you. Let me explain a bit, from a bride’s perspective, and then from a vendor’s. Thomas and I really wanted a singer/guitarist duo to perform at our wedding. We didn’t have one in mind, but we really wanted that “hanging out at a cafe enjoying brunch” type vibe for our day. So, we started doing research. We went to Google. We went to WeddingWire. We physically went to restaurants and ate brunch in search of our perfect duo. I reached out to vendor friends for recommendations. Finally, we found “our duo.” We reviewed their site. We watched them on YouTube. We creeped them on Instagram. We adored them – every single thing about them. They are the cutest and amazingly talented! We knew we wanted them to perform at our wedding. We reached out to these two after a few days of mulling it over. It was a nice inquiry sent through their site (I can’t remember what it said, because it is all in cyberspace now) but we talked briefly about what we envisioned for our day, what kind of vibe we were going for and that we thought they would be the perfect fit. Well, you know what happened? They said they weren’t really available for us, as they would be traveling throughout the US touring at colleges. I was heartbroken. There was no one that we had seen that came close to these two. They were kind enough to recommend other singers/guitarists in the area. We did more research, reached out to a few more individuals, but we kept coming back to our original favorites. So what did we do? We (ahem, Thomas) wrote them another email. He poured his soul out. He told them the full story. He told them how much we adored them, how we hummed their music, and how we danced in the kitchen to their songs that they had written. We wanted our first dance to be to one of their originals. He put all of his awesome personality into this email and really explained how much we were hoping for them to be a part of their day. And then you know what happened? They said that they had to be a part of our day. They said they would drive from Ohio overnight in their RV to sing while we had our first dance as husband and wife. Sure, maybe this is a crazy exception and I know it isn’t necessarily the norm, but what I realized was how important it is to truly express your interest in having someone be a part of your day. Now, as a photographer, I will repeat the exact same message (and hope that I don’t sound like I’m venting). More than half of the inquiries we receive are simple. Couple’s name. Date. Venue. A sentence asking for a quote. Now, you may think that is perfectly fine (and for a lot of vendors, it might be), but think about it from our perspective for a second. I have no chance of impressing a couple with my response. I’m going to send my template email because I really don’t have any other option. I may add something unique about your venue, but I have no chance to personalize my response and really connect to you because I have nothing to react to. When this happens, I feel like I’m failing my couples right from the start, and I don’t have the chance to even put my best foot forward. On the other hand, some days I receive the best emails- the emails that make my day – week – or even month! “Our vision for our wedding day is a time that we can celebrate each other and our love! We want it to feel very romantic, organic, and joyous. We want everyone to feel relaxed and happy, especially ourselves. Our four bridesmaids will wear blush pink dresses, and our flowers will be very neutral with white & blush flowers, and lots of beautiful greenery. 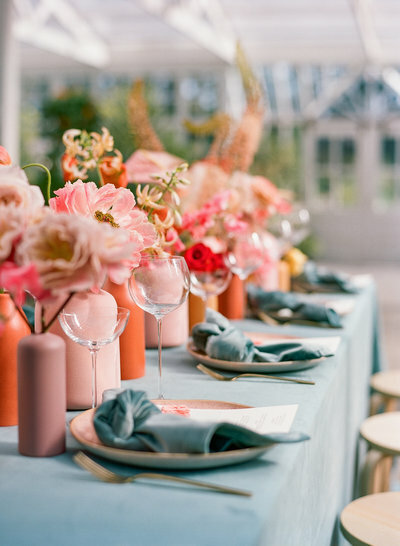 We would like to have candlelight on the tables to show off our unique centerpieces – each table will feature a different fresh fruit arrangement (pomegranate, figs, berries, blood oranges, etc.). We are working on getting some very talented friends to play live music at the reception. If it works out, we will either have a grammy nominated trio (piano, bass, and drums), or an extremely talented band that will play covers of classic rock. I’m sure my fiance and several of his musician friends will want to get up there and play a song or two, as well! Now, after you read something like that, aren’t you smiling? Isn’t that how you want to start a relationship with someone that is going to play a big part in your wedding day? Thank you, as always, for reading! I appreciate you!